To the Obama administration, the only "real" refugees are those made so due to the actions of Bashar Assad. As for those who are being raped, slaughtered, and enslaved based on their religious identity by so-called "rebel" forces fighting Assad -- including the Islamic State -- their status as refugees is evidently considered dubious at best. The Obama administration never seems to miss an opportunity to display its bias for Muslims against Christians. The State Dept. is in the habit of inviting scores of Muslim representatives but denying visas to solitary Christian representatives. While habitually ignoring the slaughter of Christians at hands of Boko Haram, the administration called for the "human rights" of the jihadi murderers. In Islamic usage, the "cause of Allah" is synonymous with jihad to empower and enforce Allah's laws on earth, or Sharia. In this context, immigrating into Western lands is a win-win for Muslims: if they die in the process somehow, paradise is theirs; if they do not, the "locations and abundance" of the West are theirs. Muslims all around the U.S. are supporting the Islamic State and Muslim clerics are relying on the refugee influx to conquer Western nations, in the Islamic tradition of Hijrah, or jihad by emigration. The fate of those Iraqi Christians who had fled from the Islamic State only to be incarcerated in the United States has finally been decided by the Obama administration: they are to be thrown back to the lions, where they will likely be persecuted, if not slaughtered, like so many Iraqi Christians before them. 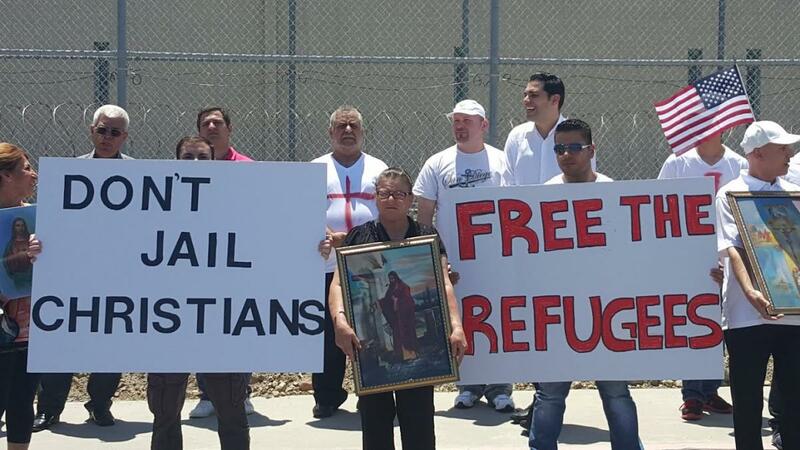 Fifteen of the 27 Iraqi Christians that have been held at a detention center in Otay Mesa, California, for approximately six months, are set to be deported in the coming weeks. Some have already been deported and others are being charged with immigration fraud. Many of the Iraqi Christian community in San Diego -- including U.S. citizen family members vouching for the refugees -- had hopes that they would eventually be released. Mark Arabo, a spokesman for the Chaldean community, had argued that "They've escaped hell. Let's allow them to reunite with their families." One of the detained women had begged to see her ailing mother before she died. The mother died before they could reunite, and now the daughter is to be deported, possibly back to the hell of the Islamic State. The answer is that the Obama administration defines refugees as people "persecuted by their government." In other words, the only "real" refugees are those made so due to the actions of Syrian President Bashar Assad. As for those who are being raped, slaughtered, and enslaved based on their religious identity by so-called "rebel" forces fighting Assad -- including the Islamic State -- their status as refugees is evidently considered dubious at best. "What difference does it make which army imperils the lives of innocent Christians? Christians are still be[ing] slaughtered for being Christian, and their government is incapable of protecting them. Does some group have to come along -- as Jewish groups did during the Holocaust -- and sardonically guarantee that these are real human beings?" In fact, from the start of Western meddling in the Middle East in the context of the "Arab Spring," Christians were demonized for being supportive of secular strongmen like Assad. In a June 4, 2012 article discussing the turmoil in Egypt and Syria, the Independent's Robert Fiskscoffed at how Egyptian presidential candidate "Ahmed Shafiq, the Mubarak loyalist, has the support of the Christian Copts, and Assad has the support of the Syrian Christians. The Christians support the dictators. Not much of a line, is it?" The Obama administration never seems to miss an opportunity to display its bias for Muslims against Christians. The U.S. State Dept. is in the habit of inviting scores of Muslim representatives but denying visas to solitary Christian representatives. While habitually ignoring the slaughter of Christians at hands of Boko Haram, the administration called for the "human rights" of the jihadi murderers. And when persecuted Egyptian Copts planned on joining the anti-Muslim Brotherhood revolution, Obama said no. Then there is the situation that every Arab nation the Obama administration has meddled in -- for example, Libya and Syria -- has seen a dramatic nosedive in the human rights of Christian minorities. 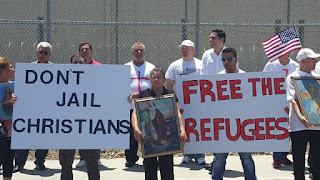 The Obama administration's bias is evident even regarding the Iraqi Christians' illegal crossing of the U.S.-Mexico border, the occasion on which they were arrested. WND correctly observes: "At the same time the Obama administration [is] deporting Christians, it has over the years allowed in hundreds of Muslim migrants from Africa and the Middle East who crossed the Southern border the same way the Chaldeans did." Meanwhile, as the Obama administration nitpicks at the definition of refugee and uses it against severely persecuted Christian minorities, it turns out that four out of five migrants -- or 80 percent -- are not even from Syria. And whoever emigrates for the cause of Allah will find on the earth many locations and abundance. And whoever leaves his home as an emigrant to Allah and His Messenger and then death overtakes him -- his reward has already become incumbent upon Allah. All the while, the Obama administration is turning away Christian refugees fleeing the same hostile Muslim forces as Muslims -- who are being welcomed into America and Europe.